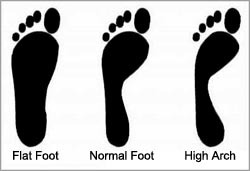 How to determine which type of feet you are having? Do a foot print test and compare the result the pictures below. Looking at your foot, you’ll know you have flat feet if you don’t see any arch in order words, the bottom of your foot, from your toes to your heel, is completely flat. You will need a running shoes that maintains your stability. Look for shoes that offer “motion control” and “stability”. To further improve your stability you might want to include orthotic(custom-made shoe inserts that correct foot issues). You are most likely an overpronator, which means that your feet roll inward when you run. Which in turn will cause shin splints, back problems, and tendonitis in the knee if no proper foot wear is used. If you look your foot and it doesn’t look flat-footed or high-arched, you most likely to be a normal foot. You will have a wide variety of running shoes from neutral running shoes to slightly flat or high arched feet. It will not be advisable to buy shoes that offer alot of stability or motion control. As long as you pick a running shoe that doesn’t counteract your foot type, you shouldn’t encounter any problems. This is the most common type of foot, and it’s also the least prone to injury. You’ll notice a high and definite arch on your foot. When you push your hand against the bottom of your foot, your arch will stay rigid. Look for shoes that provide flexiblity and cushioned so that your midsole is able to absorb shock. You are probably supinate or underpronate, which means your feet roll outwards as you run. It’s important for high arche’s runner to keep track of their feet because it causes their arches to fall thus making their feet longer.